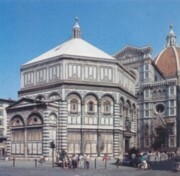 Admire the beautiful city centre of Florence: Your tour will start from the Santa Maria Novella Square, then You’ll reach the famous Duomo (internal visit) and Baptistery (external visit). 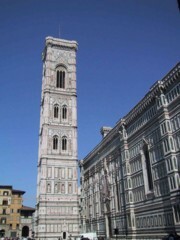 You'll discover the Campanile di Giotto (external visit) that is a beautiful bell tower banded with pink, green, and white marble. 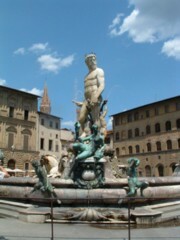 You’ll go to the Piazza della Signoria with its Fountain of Neptune (Fiorentines mocked it as The big whitey).The David that You can see in the square is a copy of the original statue by Michelangelo, which was moved to the Accademia in the 19th century. By the arcades of the Uffizi Gallery You’ll arrive on Ponte Vecchio, there are a lot of jewellery shops , but all with pretty much the same merchandise. 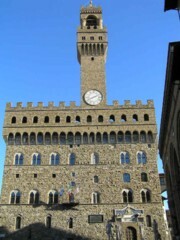 The Basilica of Santa Croce (Basilica of the Holy Cross) will end Your tour in Florence. In this church You’ll also find the final resting places of many notable Renaissance figures-over 270 tombstones pave the floor, and monumental tombs house luminaries like Michelangelo, Galileo, Rossini, and Machiavelli. 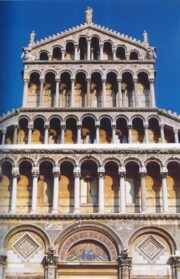 In Pisa you will be able to explore the Campo dei Miracoli (Field of Miracles) with its famous Cathedral, an inseparable part of the marvellous four-piece ensemble of masterpieces of architecture and art which makes the piazza what is. The group of buildings so scenographically set in the piazza del Duomo of Pisa leave the visitor with an impression in part real and in part unreal, like a fairy tale, due first and foremost to the striking contrast of the white marble with the green lawn und blue sky. The unforgettable façade rises up, like the entire building, from a broad marble pavement that surrounds it. The lower order, scanned by pilaster strips and crowned by blind arcading in part decorated with lozenges, has three bronze doors, cast by Portigiani, with 17th –centuryt reliefs by followers of the circle of Giambologna, which replaced the originals by Bonanno after they were destroyed in the fire. The four upper tiers, which diminish in height, are pierced by the same number of galleries with marble columns and arches. Decorative sculpture rises on the coping and at the sides of the façade. 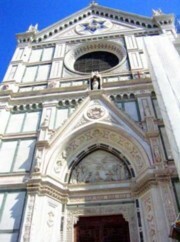 A Madonna and Child, attributed to Nino Pisano, stands on the tip of the tip of the gable, with statues of the Evangelists at the corners, and Angels right below. Two other statues of the Evangelists are set at the end corners of the side aisles. In the lowest tier with a sham portico in which elements of classical architecture are combined with decorative elements of clear Byzantine derivation colored marbles and geometric ornaments, sunken lozenges, bas-reliefs, friezes, cornices, sculpture, but above all polychrome marble intarsias create a particularly rich decorative fabric. The profusion of ornament on the large central portal is the first thing to be noticed. 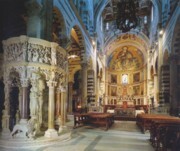 The two engaged half-columns at the sides are decorated with bas-reliefs and foliated capitals, sprouting monstrous figures. 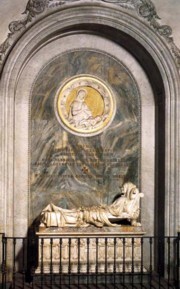 The mosaic in the lunette depicts the Madonna. It is a 19th-century work by Giuseppe Modena da Lucca, who also did the mosaics on the two side doors. The historiated panels of the bronze doors depict Events in the Life of the Madonna. S. Reparata (left door) and St. John the Baptist (right door) appear in the lunettes of the two side doors while Episodes from the Life of Christ are depicted in the bronze panels. Take water, camera & sun cream; wear comfortable shoes. In low season warmer clothing may be required! THIS SHORE EXCURSION WILL OPERATE RAIN OR SHINE, SO BE PREPARED FOR ALL WEATHER CONDITIONS. Closed New Year's Day, Easter Sunday, Feast of St. Anthony (13 June) Feast of St. Francis (4 October), Christmas Day and Boxing Day; during the Florentine Historic Football Matches; in the case of extraordinary events or manifestations extraneous to the Opera di Santa Croce, but held in the square in front or in the environs of the Monumental Complex, for reasons of law and order it may be necessary to suspend tourist visits even on other days. Wash, drain, dry and mince the nettle. Grind the peppercorns with a pestle and add a tbsp of liquamen; then put all in a pot with oil and liquamen and boil. Make cold and add beaten eggs; mesh. Cook in a bain-marie in oven 130° for 75-80 minutes. Sprinkle with pepper and serve, hot or cold.